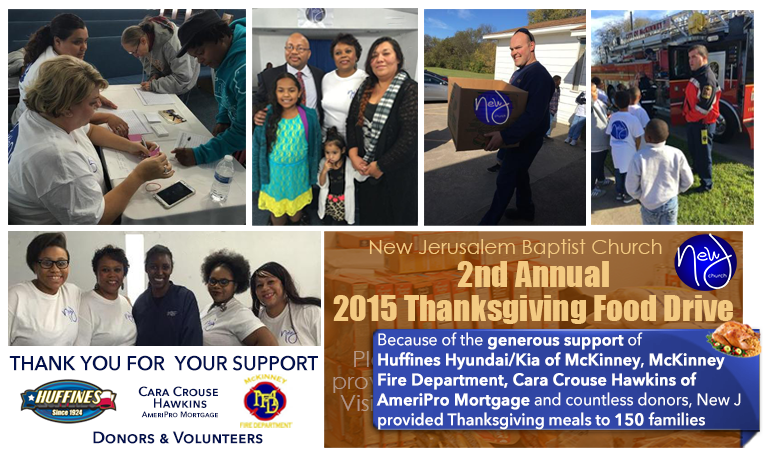 Many thanks to Huffiness Hyundai/Kia of McKinney, McKinney Fire Department, Cara Crouse Hawkins of AmeriPro Mortgage, the New Jerusalem Baptist Church Family, and countless donors & volunteers for your contribution to the New Jerusalem Baptist Church Annual Thanksgiving Food Drive. With your generous support, we were able to provide 150 families Thanksgiving meals in the McKinney area. Your generosity enabled us to fulfill our mission “to encourage and empower those in our local community, and abroad through community outreach.” Again, thank you for your contributions. Lives were changed because of you!